After having landed at Sidi-Ferruch in june 1830 and having seized Algiers in july, french troops undertake the conquest of the region which was opening out to them westward and eastward. Their strengh requirements were considerable to such a point that, one month after their presence on this territory, marshall De Bourmont, commander-in-chief, begins a first attempt of natives enlistment in the french army ranks. He appeals as early as the month of august 1830 to kabylian tribes which traditionally supplied turkish with soldiers. Five hundred natives from Zouaouas tribe, within the limits of Constantine province, form the first native troops which fight on foot with the french. They have been called the Zouaves. On october 1rst, 1830 they are organized in two battalions. It’s the december 25, 1835 ordinance which creates very officially the ZOUAVES troop unit. It becomes a regiment on september 8, 1841. Since that date arabo-berbers disappear from their ranks and the Zouaves units will be in future composed by europeans. During the campaign of Algeria conquest the Zouaves don’t have any repute in France. We must wait untill second Empire in order to make their reputation knowned by the general public. And it’s in the reign of Napoleon III that they are admired both for their feats of arms and their uniform. Because what will be particularly remembered among Zouaves it’s their uniform. Just to perpetuate their assignment to the ottoman troops, the zouaves have been equiped with a dress called “oriental”, composed by a bolero made with dark blue cloth weared on a waistcoast made with the same cloth and with madder loose-fitting trousers called saghouel. The headdress is a madder felt-wool chechia which is gallantly weared by the zouave on his head back. In order to complete his silhouette our man surrounds his waist with a wide blue flannel waistband. and - blue for the fourth regiment (Tunis). Concerning this 4th Regiment let’s explicit the rule which specifies that all the regiments which have received a number multiple of 4 ( the 8th, the 16th, the 24th, etc...) are Tunisian Regiments. It’s with this oriental dress that the zouaves glean their first laurels in all the second Empire campaigns. They also defend the national territory when it is threatened, either during the 1870-1871 war or both of the XXth century world wars. Curiously they are not sent to Indochina from 1945 to 1954. They finally serve in Algeria up to 1962. There will be as many as 19 Zouaves regiments of which six are decorated with Légion d’Honneur. Their traditions were kept in the XXth century french army through the CNEC- 9th Zouaves in the Ardennes. Alas their colour has been reinstated to the Army museum of Paris in 2006. The Légion Etrangère is a peculiarity very specific to France. At all times foreigners have proved a distinct partiality for the service of France arms. It’s not surprising that in 1830 the troops necessity required for the Algeria conquest war of attrition gives to the government of this time, in order to save french blood, the idea to use men who were dragging out in the taverns of the capital, mostly foreigners. They were the former mercenaries from Hohenzolern Regiment, or former swiss guards, or survivors of europen revolutionary insurrections, and also bad lots who had an argument with the police. By creating on march 9, 1831 a “Légion Etrangère composed by seven battalions in order to serve out of the Kingdom continental territory”, the new king of France, Louis-Philippe, kills two birds with one stone : to reinforce the theatre of operations in Algeria and to move away from Paris parasites troublemakers. The first year when it has been created the Légion Etrangère didn’t fight. It has complied with the building requirements that necessitated the territories newly exploited : swamps draining, roads, bridges, fortifications, etc... From this year of 1831 dates its builder-soldier’s reputation. A légionnaire is never kept inactive. The Légion Etrangère has got its baptism of fire at Maison Carrée on may 23, 1832. Since that date it will take part in all the fights where France will be involved. And its colours are among the most decorated of french army. As far back as 1842 it builds its garrison at Sidi-Bel-Abbès which becomes very quickly its home and its sanctuary. It’s in this city that will be trained all the recruits newly enlisted who will bring all over the world the arms of France glory. Camerone fight in 1863 in Mexico is the Légion Etrangère most famous feat of arms and will become the légionnaire spirit symbol expressed each year at its anniversary by all the units wherever their location is and whatever is their mission for the time being. Sixty six légionnaires have been resisting up to death against the assault of 2.000 thousands mexicans with abominable climatic and logistic conditions, out of respect for the given word : “ to defend themselves up to death”. Same as the Zouaves, the légionnaires thrill the crowds who attend their parades because, of course, of the glory they represent, but also because of their uniform feature : green epaulettes with red fringes, the same blue flannel waistband as the one worn by the Zouaves ( specificity of the Armée d’Afrique Infantry ), and above all, the Képi blanc (white képi). This képi colour goes back to the 1930 years at the time of Morocco campaign. During their operations in this country struck by a warm and devastating sun, the légionnaires were protecting their képi with a catechu coloured cover. This colour moreover fitted well to the country which was crossed by the légionnaires columns. The head perspiration under this burning sun compelled the légionnaires to wash frequently their képi-cover. The repeated washings have made waning the képi-cover catechu colour which has finished becoming white. The képi covered by its white muff has appeared officially for the first time during the july 14th parade in Paris on 1939. 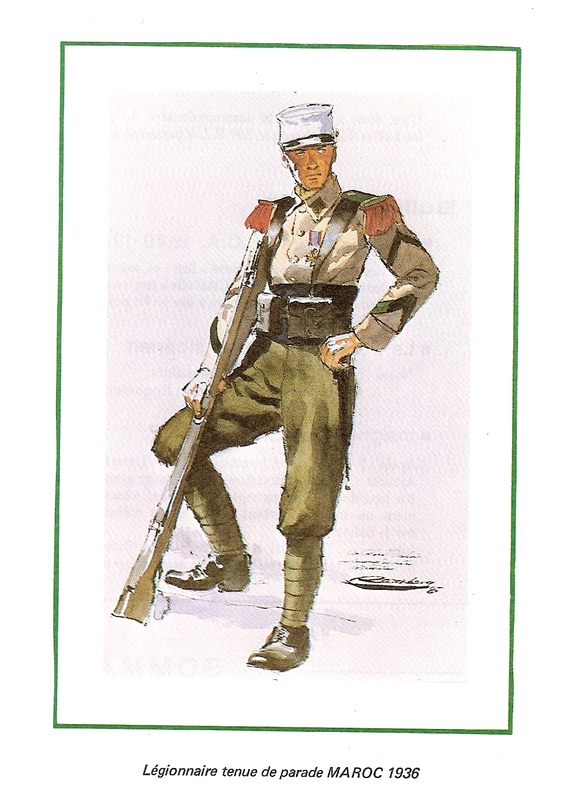 Since then it has become the distinctive symbol of the légionnaire uniform. In order to get an idea of the strengh volume represented by the Légion étrangère, we must know that it has never represented more than ten regiments. At the beginning of this XXIth century it is composed, roughly, by 7.000 men. It has reached a total volume of 49.000 men at the beginning of second world war. But its average strength during 177 years of its existence remains modulated to 10-15.000 men. Except the two world wars : 1914-1948 ( 3.630 dead ) and 1939-1945 (8.100 dead), among all the campaigns in which the Légion étrangère has taken part, three have been particularly murderous : Morocco campaign (1920-1935) with 1.300 dead, Indochina war (1945-1954) with 9.100 dead, and Algeria war (1954-1962) with 1.630 dead. Fully-integrated component of the tremendous Armée d’Afrique, the Légion étrangère is the only troop which has not been disbanded in 1962 after independence of Algeria. Its repatriation to the mother-country at this date offended nevertheless the king of France’s ordinance spirit which had formed it on march 9, 1831 by specifying clearly that the “Légion étrangère” was created “in order to serve out of the kingdom continental territory”. More than 150 nations are today represented in its ranks. Composed by 7.000 men, the Légion étrangère continues always to serve France with “Honour and faithfulness” on all the continents where this country is forced by the international context to intervene. It’s not necessary to tell you that its efficiency and its professionalism cannot be the fruit of something else but a rigorous discipline. A discipline even more severe has been at the origin of the Infanterie Légère d’Afrique (Africa Light Infantry) seeing that its battalions recruiting has been made among the men who had suffered a military sentence and who had to finish their draft time, as well as among the gaols or the prisons inmates. The decree of june 4, 1832 confirms this suggestion and creates on the african land two infantrymen battalions which are named Bataillons d’Infanterie Légère d’Afrique (B.I.L.A.) By contraction they are called “ Bat’ d’Af’ “ or also “ Joyeux “ ( Joyfull ). The B.I.L.A. distinctive colour is purple. Don’t confuse “ Bat’ d’Af’ “ with Discipline Units or Expelled Platoons which are units specially formed to receive all kinds of delinquents who are considered as undesirable in their units or as very dangerous to serve in a traditional unit. Because of the origin of their men, the B.I.L.A. applied in their ranks an iron discipline. That is what has fabricated and put a mark on their reputation with this characteristic that they were units lighter than Line Infantry and better adapted to the kind of combat which were imposed by their adversaries, North Africa native dissidents extroardinarilly mobile. As soon as they are created they are used for the conquest of Algeria. They take part to eastern operations up to Constantine siege in 1836. Their first feat of arms, which will stay the date of their feast same as the Camerone celebration at the Légion étrangère, has taken place less than eight years after their creation, in february 1840 at Mazagran ( 3 km west of Mostaganem ). A 123 men company resisted during four days to an attack by 12.000 assaillants who, because of this relentlessness, finished by losing heart and by withdrawing after they had suffered heavy casualties. The B.I.L.A. are not organized with regiments but with battalions. In total there were 13 battalions and this depending on the circonstances and the locations. They have served in Algeria, in Morocco then in Tunisia, especially in the big south of North Africa. In the collective memory their principal setting up stood bound to the tunisian big south. They have not served less than participating to the main campaigns of the colonial expeditions : China, Tonkin, Dahomey. They also fight in France during the two world wars of 1914-1918 and 1939-1945. They take part to the Indochina war and then to the Algeria war. They finish their existence in the french Coast of Somalias (today Republic of Djibouti) where they have been disbanded in 1972. As soon as it has landied at Sidi-Ferruch in june 1830, during the first months of the exploration of the vast territory which was in front of it, french command made the mistake to think that the army would have to serve pooled and, without doubt, to lay siege. It couldn’t imagine having to pursue with small units independent, quick, light and rough, an enemy extremely mobile and flowing. This explains the lack of cavalry in the expeditionnary forces which had got only three Chasseurs à Cheval squadrons. Don’t be surprised if the first requirement of reinforcement with native strength was based on horse units. Like this have been created at the beginning of 1831 two squadrons of “Chasseurs Algériens” recruited among the natives and connected with the Zouaves troops, themselves set up, if you remember, in august 1830. From these native squadrons are formed two regiments of “Chasseurs d’Afrique” by the royal ordinance of november 17th 1831. 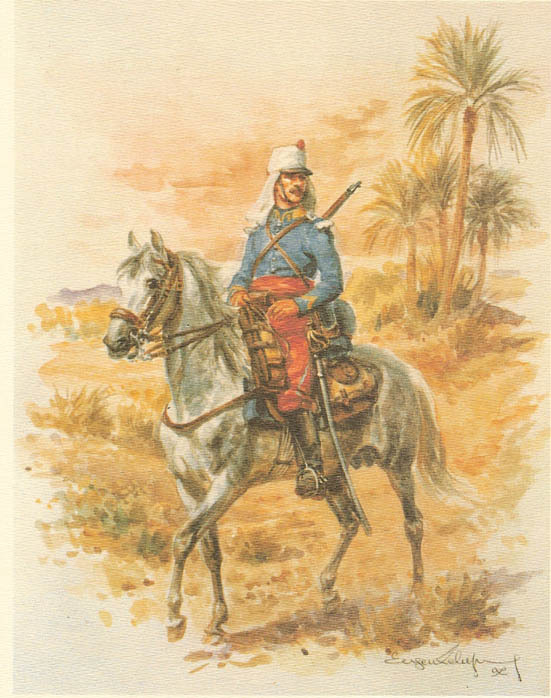 In 1839 it is considered as necessary that french soldiers must be incorporated into these not very disciplined arabo-berber horsemen units. 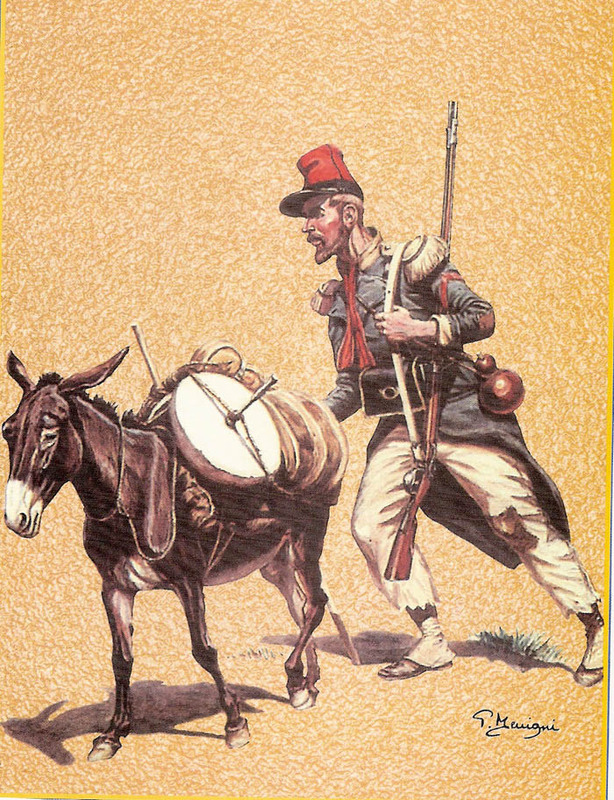 But the command notes that “customs, uses, religion, dresses and the way of life of the natives don’t allow arab horsemen to be diluted in the french squadrons of the Chasseurs d’Afrique Regiment”. 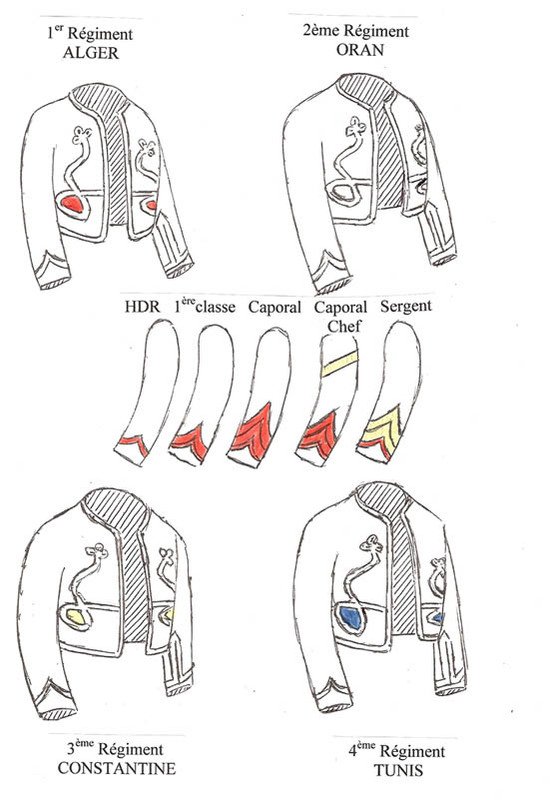 In december 1841 the native squadrons of the four Chasseurs d’Afrique Regiments are transfered to the Spahis troops newly created and much more adapted to the natives way of fight. And that is how the Chasseurs d’Afrique become fully french. Very quickly their experience of the war in Algeria will promote the Chasseurs d’Afrique to the french cavalry first rate.There is not any campaign where the Chasseurs d’Afrique have not been participating. The cross of Légion d’Honneur is awarded to the 1rst R.C.A. ( Regiment of Chasseurs d’Afrique ) standard-flag as soon as 1863 in order to reward it for the capture of a mexican Lancers standard-flag in the fight of San Pablo Del Monte, close to Puebla, during the campaign of Mexico. The Chasseurs d’Afrique attract attention once again during the 1870-1871 war of France against Prussia. The tremendous charge of Marguerite Division on september 1rst, 1870 at Floing doesn’t bring any tactical result but snatches from the King of Prussia the famous words of “Ah ! The gallant men ! “ Three regiments of Chasseurs d’Afrique had charged several times throroughly, ready to charge again “ as long as one will be staying “, for honour, and their casualties were considerable. The most brilliant officers solicit as a favour the honour to serve in the Chasseurs d’Afrique. The non-commisionned officers give back their rank in order to join them. Promotion among them is blocked because of the rush of volunteers. They form not only a great crowd of eccentric guies, but they make up the vivid tradition of the war practical experience. They don’t have any other ambition than fight. Their headdress has always been peculiar. At the end of XIXth century they wear the “taconnet”, 1873 design cavalry cap, frequently covered with a white calico. Since the end of XIXth century the Chasseurs d’Afrique have adopted the madder chechia, put on high and straight, with three parallel black strips at the bottom. These three black stripes recall the mourning of the three Chasseurs d’Afrique regiments which had charged at Floing in 1870. In addition to the colonial expeditions which they participate to in the XIXth and XXth centuries, we meet them also during the two big word wars of 1914-1918 and 1939-1945 not only on the french national territory, but also in the Balkans and in the East from 1916 to 1919 as well as in the Levant untill 1941. They are part of the french troops stationed in Germany after the second word war. Curiously the Chasseurs d’Afrique haven’t fought in Indochina from 1945 to 1954. They take part completely to the Algeria war from 1954 to 1962. The last Chasseurs d’Afrique regiments are disbanded in France in 1964.